Below you can view all the homes for sale in the Richthofens Montclair subdivision located in Denver Colorado. Listings in Richthofens Montclair are updated daily from data we receive from the Denver multiple listing service. To learn more about any of these homes or to receive custom notifications when a new property is listed for sale in Richthofens Montclair, give us a call at 720-729-2320. Originally built as a convent for St James Church, this one-of-a-kind residence is not to be missed. Come see it today! MLS#2237595. COLDWELL BANKER RESIDENTIAL 24. Come take a look and wait no longer. LIV your Colorado dream today! MLS#7282314. LIV Sotheby's International Realty. Shopping near, transportation is near. Downtown Denver is min away . MLS#5852267. Keller Williams Realty Downtown LLC. Your Buyers Won'T Be Disappointed With This Hot Montclair Gem! Buyer To Verify School Information. MLS#2233788. MB Pezzuti & Associates. Great location with easy access to shopping and parks. MLS#8744476. KENTWOOD REAL ESTATE DTC, LLC. This is truly an exceptional property! MLS#2452286. ERA New Age. ***Be sure to check out the Virtual Tour*** MLS#2990669. RE/MAX ALLIANCE. Located minutes away from Lowry, Stanley Marketplace, and much more! MLS#4733573. RE/MAX of Boulder. Open House on Sat 4/13 & Sunday 4/14 from 11-2*Fabulous location within blocks from Montclair park, restaurants, bars and coffee shops*4 bedroom + Flex room + finished basement equals ample space for everyone*Great airbnb, rental or income potential*Beautiful hardwood floors on the main floor open up to an updated kitchen with granite countertops, cherry-stained cabinets and metal backsplash*Wood-burning fireplace with a brick façade and bar countertop space in the finished basement*Oversized 2 car detached garage with work space + 2 additional off street parking spaces and shed** MLS#7977331. Kentwood Real Estate City Properties. If you value a booming location yet quiet tree-lined streets then you have just found your dream house. MLS#4123800. Thrive Real Estate Group. Call now to schedule your personal showing! MLS#4170120. TRELORA. There is no better value in the neighborhood! MLS#7891130. Uptown Realty Group LLC. The house comes with the movie theater and surround sound set up in the basement. MLS#2734358. Brokers Guild Classic. Within walking distance of King Soopers/Safeway, just blocks from Montclair park, and a quick drive or bike ride to the light rail station on 40th & CO. Property is well-maintained, HOA less than $200/month. You will not be disappointed. MLS#8194963. Keller Williams Realty Downtown LLC. This lot is 1.5x the size of most Montclair lots, and has room to add a garage if city/zoning permits. MLS#1876293. Keller Williams Realty Downtown LLC. One car attached garage with additional on-site parking on the concrete strips for the driveway. MLS#2148029. PERRY & CO.
Short commute to D-Town, Cherry Crk and DIA! MLS#9441175. INFINITY GROUP REALTY DENVER. Easy walk to Lowry amenities or Colfax cool! MLS#1953579. LIV Sotheby's International Realty. Don't forget the private alley driveway & 2 car garage with custom built-ins! MLS#2914329. RE/MAX ALLIANCE. Convenient to shops, grocery, restaurants, parks and RTD. MLS#5214646. RE/MAX Cherry Creek. 1125 Xenia is subject to a lease through 30 June 2019. MLS#7085042. Your Castle Real Estate Inc.
Close to Montclair Rec center, Montclair, Denison & Mayfair parks MLS#2845103. LIV Sotheby's International Realty. A new owner will appreciate the unique style and charm of this home. Make it yours today! 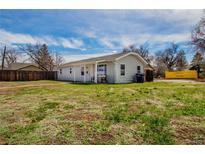 MLS#8427737. Kentwood Real Estate Cherry Creek. Convenient to Downtown, Lowry, shopping, entertainment, parks & rec. A must see! MLS#5049311. COLDWELL BANKER RESIDENTIAL 24. Radiant heat on main level floors*All new engineered floors, upgraded carpeting and cool tiles*New Kitchen and Bathrooms*Elegant color choices and plenty of natural light your buyers will enjoy*Gas log fireplace makes for classy and comfortable entertaining. Bring your pickiest buyers! MLS#3874164. A Better Way Realty.